15 or so years ago, while enrolled at a Christian graduate school, I went to an evening seminar in which the speaker, a well-known visiting professor from a prestigious university, was to present on the Rev. Dr. Martin Luther King Jr.’s theology. The turn-out from the largely white campus was small, especially given the topic and professor’s reputation, but what I most remember was how much of the presentation was dedicated to making the case for King’s Christianity. It was as though the professor knew that, before discussing King’s theology, he had to convince his mostly white, Christian audience that the most revered preacher America has ever produced was… a Christian. I’ve thought a lot about that strange moment over the years and again on this 50th anniversary of King’s assassination. I’ve learned so much from him in the past 20 years, about theology, preaching, organizing, prayer, and more. But what I’ve most learned – what that 15-year-old memory reminds me of – is how white people, including Christians, generally respond to movements for racial justice. Wether debating King’s movement strategy, American loyalty, or Christian faith, white Christians were quick to find ways to discredit the movement for racial justice and thus ignore or oppose it. In this regard, as that college seminar revealed, very little has changed in the 50 years since King’s murder. Occasionally I’m asked about how white people respond to things I write and say publicly about racial justice. The assumption, correct much of the time, is that the responses can be harsh. In fact, I think very little about these responses anymore. Mostly this is because I know how much more opposition my friends of color, particularly women, face when they speak for racial justice. Any flak I take is small in comparison. But the other reason I’m not surprised about these typical and troublesome responses is that King prepared me. He taught me to understand how unrepentant whiteness responds when the possibility of genuine racial justice surfaces. Let me be more honest: King taught me to anticipate my own backlash to racial justice. His words and actions, and the violence they provoked, help me to see the violence within myself. Under his influence, I’ve come to doubt my initial responses to calls for racial equity and repair. The privilege and blindness that comes with my race make my emotions and experiences untrustworthy guides in the journey toward justice. King taught me to submit my instincts to the wisdom of those friends who exist outside of whiteness’s blinding lies. King taught me to understand and anticipate the tepid caution, dangerous opposition, and utter irrelevancy of most white responses to racial justice. This backlash has exerted only a tiny price from me but this week we remember that for many others the cost has been deadly. Fifty years ago Rev. Martin Luther King Jr. was imprisoned in Birmingham, Alabama, scratching out a modern epistle in the margins of a newspaper. The Letter from a Birmingham Jail was a direct response to a letter published in the local newspaper written by a group of Birmingham clergy who were critical of the civil rights movement which had upset the balance in the “Magic City”. Rev. King’s response was nuanced and not without charity. It was also very direct. Letter from a Birmingham Jail is especially fascinating for its open criticism of those Christian leaders who considered themselves progressive yet who distanced themselves from the Civil Rights movement. Rev. King’s logic and critique reveal the strange and disappointing relationship between white Christians and their pastors and the experiences of their African American brothers and sisters in the Faith. As Edward Gilbreath shows in his new book, Birmingham Revolution, the relationship is no historical artifact. Rev. King’s critique retains its prophetic edge today. Gilbreath acknowledges that Rev. King’s life, including this important episode in Birmingham, have been extensively documented, analyzed, and interpreted over the years. So why another book? Gilbreath’s unique and helpful contribution comes from his journalist’s eye, his commitment to Christian faith, and his long experience in white and black churches. From this vantage point he weaves a captivating narrative that pulls from history and contemporary events and shows the ongoing relevancy of Rev. King’s letter. To show why the letter still matters Gilbreath ranges far and wide: NPR stories; many interviews, including with those who participated in the Civil Rights Movement; The Boondocks; his own personal experiences of race and injustice. He combines an unflinching eye with a light touch and the book moves quickly, subtly building the case that Rev. King’s observations and questions should be applied to the justice issues of our day. Throughout the book we meet lesser-known heroes of the movement- Rev. Fred Shuttlesworth is one the author is especially drawn to, and for good reason! We’re left wondering about who our contemporary foot soldiers are. Who are the women and men whose faith directs them toward such courageous compassion and critique? Just like Luther’s memo nailed to the Wittenberg Church door, King’s jailhouse epistle is a document teeming with deep and challenging ideas about theology, justice and freedom. If we allow it, we’ll find King’s freestyle meditation will take us on a sweeping journey form the Birmingham, Bible Belt, Deep South of 1963 to the postracial, post-Christian, Red State-Blue State cacophony of twentieth-first-century America and beyond. Glibreath is just the right guide and Birmingham Revolution maps the journey with precision, imagination, and just the right amount of hope. On Saturday February 22 Edward Gilbreath will be our church’s guest for a half-day conference that will be open to the public. We’d love to have you join us. I’ll share the details next month. There’s a lot of good commentary on this 50th anniversary of the March on Washington – reflections on the forgotten context and all that remains undone – but the place to start is with Rev. King’s speech, the whole thing. I wonder if the slipperiness of the word makes my earlier point that violence is less a moment in time and more the ground on which we walk. 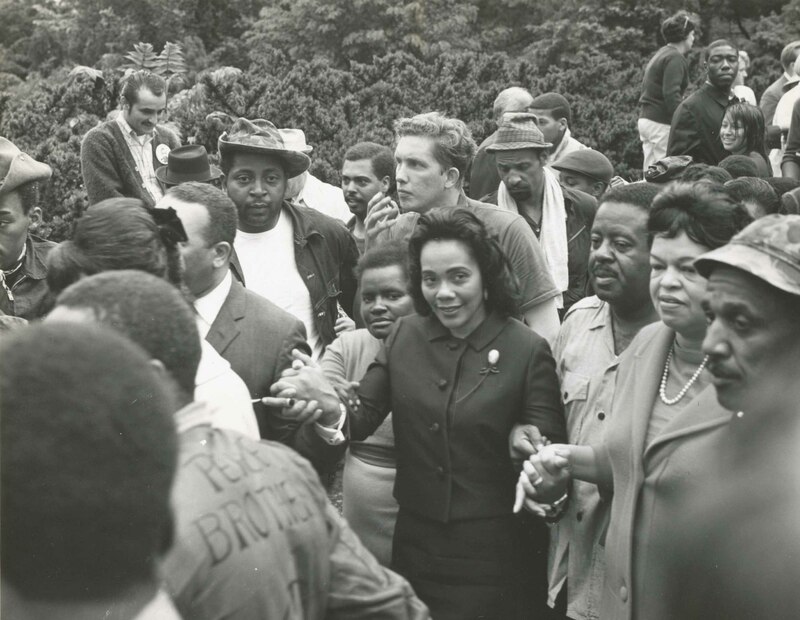 On June 19, 1968 Coretta Scott King addressed the Poor People’s Campaign in Washington DC and described the pervasiveness of violence. Poverty can produce a most deadly kind of violence. In this society violence against poor people and minority groups is routine. I remind you that starving a child is violence; suppressing a culture is violence; neglecting schoolchildren is violence; discrimination against a working man is violence; ghetto housing is violence; ignoring medical needs is violence; contempt for equality is violence; even a lack of will power to help humanity is a sick and sinister form of violence. Context always matters, no more so than in the case of Mrs. King’s remarks. Less than three months earlier her husband, Rev. Martin Luther King Jr., had been assassinated in Memphis. His was an especially violent death, captured in images and eye-witnesses accounts that still register in our national consciousness. Yet, when describing the toll of violence, Mrs. King pointed not to her husband’s spectacular and undeniably violent death but to the millions of accepted and overlooked acts that take place every day. Making the shift toward Mrs. King’s view of violence leaves us with a dilemma far more significant than a murky definition: such a view implicates not a few violent actors but most of us, most of the time.